Velma "Sue" Schell, 81, went to be with our Lord on February 28, 2016, surrounded by her family, after a lengthy illness. Funeral services will be held 10:00 AM Saturday, March 5, 2016, at Madison Park Christian Church in Quincy, IL. Chuck Sackett will officiate. Burial will be in the Kingston Park Cemetery in Kingston, IL. Visitation will be held 6:00-8:00 pm on Friday, March 4, 2016, at the Smith Funeral Home & Chapel, in Hannibal, MO. The family is being served by the Smith Funeral Home & Chapel in Hannibal, MO. Sue was born January 25, 1935, to Gilbert and Maria (Washam) Ramsey in Bynumville, MO. Sue was the beloved wife of the late Vinal Richard Schell. After high school Sue attended college at Truman State University in Kirksville, MO. Sue then moved to Kansas City, MO where she worked at Hallmark Cards. After a move to Palmyra, MO, Sue worked as the secretary at the First Baptist Church in Palmyra for a number of years; she later went on to work at the Palmyra State Bank, Liberty School as a teacher's aide, and Walmart in both Quincy and Hannibal. Her family will always lovingly remember her incredibly strong work ethic and the dedication she showed to her work. Sue was an active member of Madison Park Christian Church, a member of the WOW Sunday school class, and the church choir. Sue greatly enjoyed traveling to visit her grandchildren and great-grandchildren, spending time with family, singing and playing the piano. Family was a priority for Sue. If you weren't able to find her hard at work in the Hannibal Walmart, she was almost certainly spending time with family. 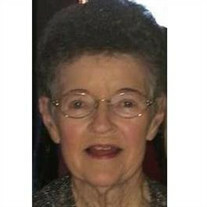 She was the devoted mother of David Schell of Hannibal, MO and Debbie (Schell) Bower of Liberty, IL. Both children survive. Sue was also the very proud grandmother of Emily (Schell) Lollar of Jacksonville, NC; Kayla Schell of St. Louis, MO; Michael Bower of Torrance, CA; Michelle (Bower) Granadillo of Los Angeles, CA; and Amanda (Bower) Nieders of Bettendorf, IA. All grandchildren survive. She is also survived by two great grandchildren, Madison Lollar and Aubree Lollar, both of Jacksonville, NC. Sue has one sister surviving, Joan Peterson of Independence, MO, as well as several nieces and nephews. Mrs. Schell was preceded in death by her husband, her brother, James "Big Jim" Ramsey, her sister, Helen "Joyce" Aurig, and her parents Gilbert and Maria Ramsey. There are few people in this world who, at the end of their lives, can say they accomplished everything they set out to do. Sue is one of those lucky few. She was happily married for 48 years. She was surrounded by a family that adored her. She was able to take trips all over the country - Hawaii (a lifelong dream), North and South Carolina, California, Iowa, as well as numerous trips to Disney World. She had a strong and lasting relationship with the Lord. Sue was truly a person that you could not help but to love. She was optimistic, always smiling, someone you could always count on, and always loved everyone. We were all so blessed to have her in our lives, and we hope that all whose lives she touched are able to join us to remember her. Memorials may be made to the Madison Park Christian Church, in care of Smith Funeral Home & Chapel.